Last weekend, one of my dearest (and oldest) friend finally tied the knot to her Prince Charming! They are now on a honeymoon but I thought I posted a tidbits from the garden nuptial since we took so many photos anyway. I particularly love the soft peachy color of our bridesmaid dress with the pale bouquet of flowers. All eight of us (bridesmaids and groomsmen) got a care package which consists of essentials for us to wear on their wedding day. The bridesmaids got their dresses, hair pieces, and shoes. While the groomsmen got their vests and ties. They even wrapped it in a personalized paper boxes. I thought that was very sweet of them! Anyway, as I said, I absolutely adore our simple dresses. There isn't much going on except for the lace detailing on our waist to sweeten the look. Plus, this dress is actually all size with elastic band at the back and the waist. Very convenient. 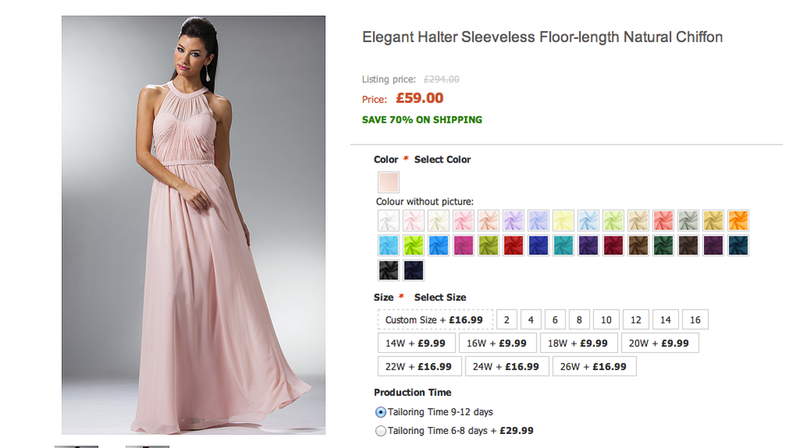 Get the similar look for your bridesmaids on PromDressOk.com by clicking this link ; Halter Sleeveless Chiffon Dress . You can have it tailored made according to your girls' individual measurements to make sure they look perfect on your big day. Not the color you have in mind? Worry not because there are so many other colors to choose from. They have a wide range of style for bridesmaid dresses (also wedding dresses and flower girl dresses) to cater to each bridesmaid's style and match their personality as well as their body type. Live Chat is also available. Customer service will be ready to answer all your questions. Well, have a happy weekend!